Superpower Dogs™ Sets The Guinness World Records™ Title For "Largest Dog Photo Shoot"
LOS ANGELES, April 16, 2018 /PRNewswire/ -- On Sunday, April 15, the team behind the upcoming IMAX® documentary Superpower Dogs™, an epic 3D live-action family adventure film about extraordinary real-life dogs, set the GUINNESS WORLD RECORDS title for the "Largest dog photo shoot." 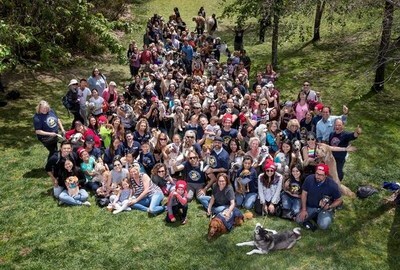 The impressive record was set while filming the closing scene for the documentary in Los Angeles, bringing 108 dogs and their owners together for "Superpower your Dog Day" - a fun-filled event celebrating the power of dogs. 108 dogs came together on Sunday, April 15 and set the GUINNESS WORLD RECORDS title for the “Largest dog photo shoot” while filming the closing scene for upcoming IMAX® documentary Superpower Dogs™. 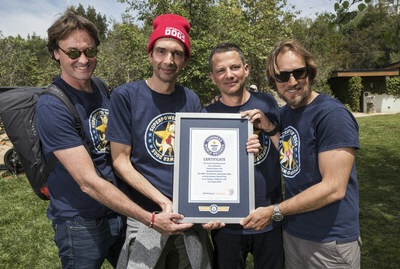 Dominic Cunningham-Reid, Producer; Taran Davies, Producer; George Duffield, Producer; Daniel Ferguson, Writer, Director accept the GUINNESS WORLD RECORD title for “Largest dog photo shoot." To support the event, the Superpower Dogs™ team and presenting sponsor Mars Petcare provided participants and their pets with a variety of dog-friendly activities, giveaways and treats in Vista Hermosa National Park in Los Angeles. Superpower Dogs™, produced by Cosmic Picture and presented by Mars Petcare and IMAX, is set to premiere in IMAX® theatres starting March 2019. This 3D film will share real stories about dogs who save lives, protect people from danger and make the world a better place. The film follows five real-life canine superheroes and their human partners as they brave earthquakes and avalanches, bring animal poachers to justice and protect humans from danger while lifting their spirits. 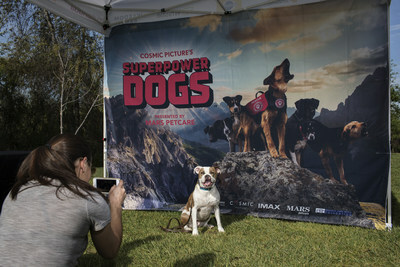 "Every dog is a Superpower Dog, and we aimed to give local pups their moment in the spotlight as we filmed the closing scene for the movie," said Taran Davies, CEO of Cosmic Picture. "We could not be more thrilled to have all of the dogs and pet owners help set the GUINNESS WORLD RECORDS title for "Largest dog photo shoot," and can't wait for people to see the film come to life in 2019." Audiences will experience how dogs see, hear and smell the world like never before, and discover how humans are harnessing the remarkable superpowers of these dogs to heal, inspire and save lives. To find out more about Superpower Dogs™, visit www.superpowerdogs.com or follow the film on social media at Facebook.com/SuperpowerDogs, Instagram.com/SuperpowerDogs and Twitter.com/SuperpowerDogs. Cosmic Picture seeks to make the most compelling cinematic experiences possible and to change people's perception of the universe in unexpected ways. Past films include award-winning IMAX® and giant screen productions and transformative environmental documentaries with tremendous social impact. For more information on Cosmic Picture, visit www.cosmicpicture.com. IMAX is headquartered in New York, Toronto and Los Angeles, with additional offices in London, Dublin, Tokyo, and Shanghai. As of December 31, 2017, there were 1,370 IMAX theater systems (1,272 commercial multiplexes, 12 commercial destinations, 86 institutional) operating in 75 countries. On Oct. 8, 2015, shares of IMAX China, a subsidiary of IMAX Corp., began trading on the Hong Kong Stock Exchange under the stock code "HK.1970." Mars Petcare is a diverse and growing business with 75,000 Associates across 50+ countries all dedicated to building our vision: A Better World For Pets™, by serving the health and nutrition needs of almost half the world's pets. With over 75 years of experience, Mars Petcare has developed an enviable portfolio of almost 50 brands, including the leading global pet nutrition brands PEDIGREE®, WHISKAS®, ROYAL CANIN®, NUTRO™, GREENIES™, SHEBA®, CESAR®, IAMS™ and EUKANUBA™. Mars Petcare is also the world's largest veterinary health provider through a network of over 2,000 pet hospitals including BANFIELD™, BLUE PEARL™, PET PARTNERS™, and VCA™. The company is also at the forefront of emerging innovation and technology for pets, pet owners and veterinarians, with WISDOM HEALTH™, a patented genetic technology testing for dogs and the WHISTLE™ GPS dog tracker, as well as the LEAP VENTURE STUDIO accelerator and COMPANION FUND™ programs to support startup innovation and the next generation of disruptors in the pet care industry. As part of the Mars family of companies, we are privileged with the freedom and the flexibility to fight for what we believe in – and we choose to fight to make our vision a reality.